It is Friday 30 September and the first night of the Derby Folk Festival 2016. The marquee is up, the rain is generally holding off and the crowds are just forming. With the choice that there is I take the thoughtful approach and decide to start the festival like the opening of a good book (with a story and spectacle) and go to the Guildhall Theatre to see “The Shanameh: The Epic Book of Kings” brought to us by production company, Adverse Camber. Broadening it’s remit this year Derby Folk Festival has programmed a piece of live theatre to flavour the start the festival. Different and contrasting to some more identifiable folk (Alma, Sam Kelly) and fan-favourites Fairport Convention on slightly later, it takes a different tack by introducing story-telling of the epic nature early on giving a chance for reflection and consideration of what is heard throughout the three days in Derby. Adapted and staged by a company called Adverse Camber (a producing company based in Cromford, Derbyshire) the stage performance of “The Shahnameh” tells a number of stories and myths that feel familiar to fans of literature and storytelling, yet surprise in their richness of character and mystery of their setting and time in ancient Persia. In having the opportunity to see this live theatrical event I feel enriched and truly grateful to have made this choice as an opening event. 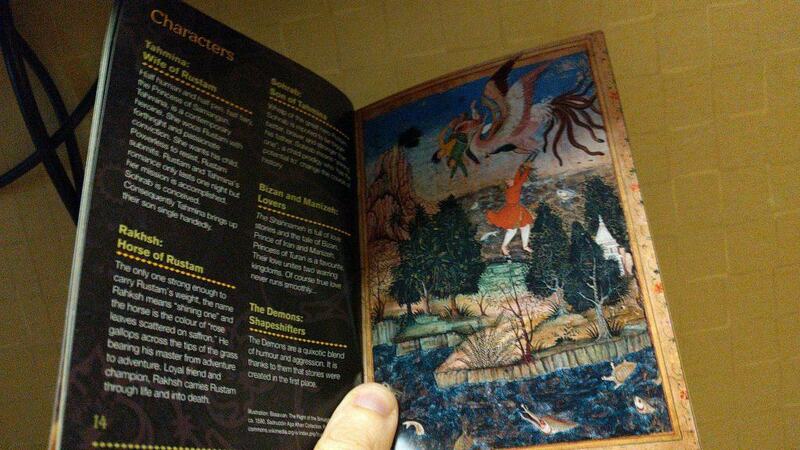 The Shahnameh is a poem and a historical account of Iran, but these descriptions does not even remotely do it justice. Written by a Persian poet called Ferdowsi between 977 and 1010BC, it does indeed tell some scholarly elements of history and politics though where it shines is the time it spends with the characters and other aspects of wonder and myth. The book has over 50, 000 lines of verse so the performance has to keep it brief! Split into a number of different ages, the company chooses to tell us some fairly action-packed adventures that come predominantly from the “Heroic Age” including stories of Rustam a powerful, several-hundred years old man dragged into the battles and politics of an array of powerful shahs, the beautiful and powerful Simorgh bird straight from imaginative myth who lends aid when it is most needed, and several other characters including Rakhsk a horse the colour of “rose leaves scattered on saffron”. A special strength in the parts and delivery of the story are these characters. Yes, the men are powerful and the women beautiful but there is deception both ways. The mother “Simorgh” bird is immensely wise and strong and a key part of the story, Tahmina is a half-human, half-fairy woman who through pure conviction and choice wants Rustam as a husband; I recommend the stories for people wanting to see gender done right and well even from an unimaginably old literary text. There is a wonderful, colourful and informative free programme with the show. These sensory descriptions give a very vivid sense of the characters but it is the combination of the storyteller and musician that make it truly dance. Told by Xanthe Gresham Knight (narrator) and accompanied with music of the time and place from Arash Moradi (musician) it builds and maintains a feeling of being taken far, it felt like some of the mundanity of life were brushed aside as we heard the wondrous lives of people thousands of years ago. 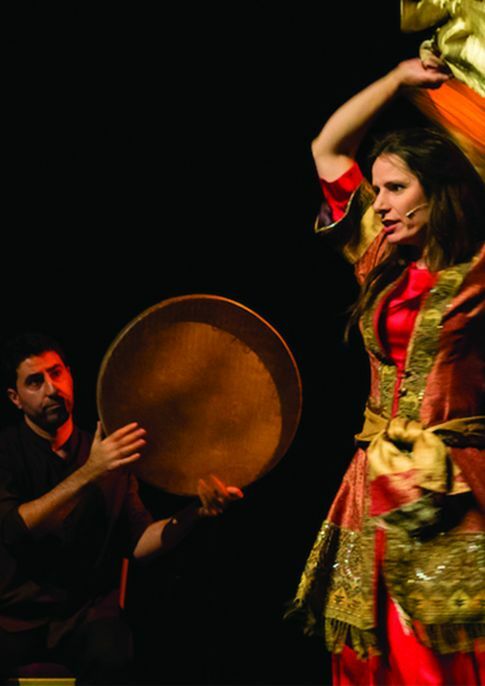 The story unfolds through the openness of storytelling in the Naqali form, a surprising and engaging form of performance that allows some improvisation and direct engagement of the audience. Several people would roll their eyes at the thought of taking part in a show they have paid to see in front of them, but Knight managed to encourage and draw the audience without being heavy-handed or coercive. By the end like all good stories they were gleefully involved with singing the chants of battlecrys and as birds of the forest, and the whole show felt like it was taking on a life of it’s own- by the interval you really wanted to know what happens next. This connection can be so hard to get in this artform and even with Knight’s exceptional experience in Storytelling (such as having numerous Storytelling Residencies) it still felt like there was a potential for it being a challenging opening as something so different within a full folk music programme, but it all goes exceptionally well and the audience was truly enthralled. As mentioned, Arash Moradi’s music is something quite special. Throughout the tests of strength, the incredibly romantic encounters and the eloquent riddles that all hallmarks of great stories, the music was ever present. The show seamlessly shifts from one instrument to the next, the drum instrument is made to make the sound of thunderous hooves from what seems like the world’s biggest horse, and the quieter encounters of the heart the next; the shades of emotion are impressive. The imagination of the stories and beliefs of Zoroastrianism were positively conveyed, the heroes felt taller, the moral quandaries greater; the music winds and shapes and like the sweetest perfume draws you in. The message and character of the show is an epic and bombastic yet thoughtful piece that captures your heart and runs with it. Credit should also go to the creative team involved with the show. Collaborating director (Kate Higginbottom), design assistant (Claudine Scheer), technical manager (Gethin Stacey), associate producer (Louisa Davies) and producer (Naomi Wilds) have come together to deliver a show that manages to tell old series of stories indeed but make them familiar and shining with an edge of gold leaf. The set is quite minimal but is used really well, the storyteller moves across it in unpredictable ways and takes a number of shapes and characters to convey the story; there is never any confusion about who or what she is representing and the direction helps with this. The stories themselves are quite striking, they remind me a little of the scale and imagination in the Ramanyana on one hand and the familiarity of nature stories like the Jungle Book on the other. A great beginning to Derby Folk, fans of storytelling cannot fail to be impressed and several others will almost definitely become converts. Adverse have managed the task of choosing an interesting story, telling it in an interesting way, and managing to involve the audience in a gentle way it is vibrant and colourful with ancient intrigue. If you get a chance to see this as it tours you really should, details are here, alongside their other storytelling tours. I look forward to seeing what else the festival has in store.